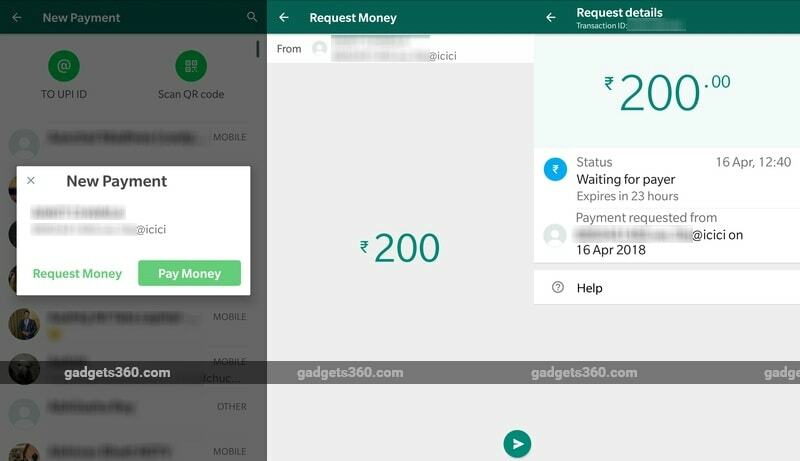 WhatsApp has received a new feature for Android beta users that lets you request money from contacts. Since the feature was spotted in testing, WhatsApp Payments only allowed users to send money to contacts. However, even now, the request money feature does not work if you select the contact directly. Instead, this WhatsApp feature is limited to payments initiated by UPI ID and QR code. It is part of the Android beta update v2.18.113, and is reportedly accessible only to a small number of users of the app. For those unaware, the UPI-based payments function of the app is presently under testing in India. To use the new request money feature on WhatsApp beta for Android v2.18.113, visit Settings > Payments > New Payments and then choose between To UPI ID and Scan QR code. After you verify the UPI or scan the QR code, and select a recipient, will be shown a pop-up that gives you two options: Pay Money (it will be called Send Money instead if you scan a QR code) and Request Money. To recall, previously, users were only shown the Pay or Send Money options. The requests are valid for 24 hours, after which they will expire. Telecom Talk first reported the development. Notably, the feature is only visible for a limited number of users on the WhatsApp beta for Android. It is amongst several rolled out in recent days, including the ability to re-download deleted media and the new vCard indexing feature. 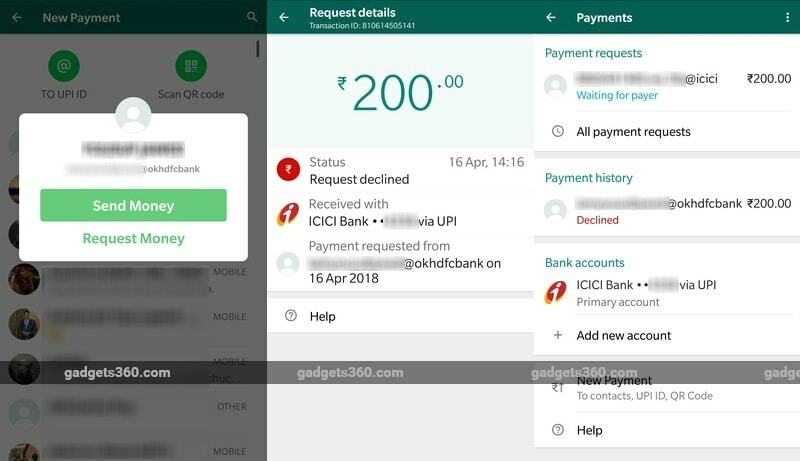 Interestingly enough, we found in our testing that regardless of whether the recipient of the money request has WhatsApp Payments enabled, they will receive the request in the form of an SMS from another UPI payment app. This could be via their bank, or, from an app like PhonePe, and this appears to depend on what UPI payment method is used by the user. Google Tez recipients got an in-app notification. This is despite the VPA address (UPI ID) being one generated by WhatsApp. After requesting money, the Settings > Payments section will now have a Payment requests section, which shows the status of pending requests. Declined or approved requests will go the Payment history section. What do you think of the new Request Money feature? Will it be useful? Do you receive a payments request within WhatsApp itself, or in an SMS like we experienced in our testing? Do let us comments section below.